Broadway Tix is provided by All Tickets, Inc. Some Broadway shows offer group comp (free) ticket programs through the Show Production and or All Tickets. Availability of programs and Comp requirements do change from show to show and are are always subject to availability. We can email you an Excel-Compatible file with the performance information found with your search. Just run your search, then enter your PIN again. You will be prompted for more information. Search the All Tickets database for special deals on Broadway shows. What do you need to run this search? Just a Date Range. What will this show me? Every deduction and price break we have available for the criteria you set. Broadway group tickets are complicated. Group minimums vary from show to show. Group prices change for many reasons, including seasonal adjustments, holiday periods, production imposed blackouts, and production management group price limitations and changes. All Tickets has no control over Group prices. Occasionally, certain shows offer no Group Discounts, and those shows may utilize a service fee. All Tickets works diligently to keep our Group price structure informative and accurate. However, due to various complexities, there is always the remote chance of error. Use the Group price information listed as a reasonably accurate reference point. We always confirm Broadway group sales through the reservation system called "STAR." Questions and confirmations may be directed to All Tickets. Broadway Tix is a searchable database of Broadway Ticket prices. Broadway Ticket prices are very complex. There are different prices, for different seats, for different performances. In addition, there are different pricing programs for different types of purchases. 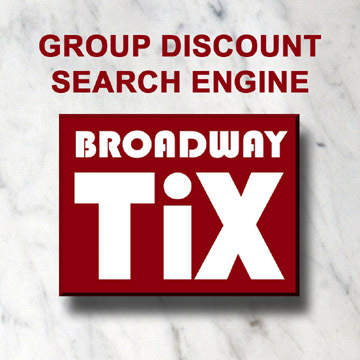 Broadway Tix allows you to seach in a variety of ways, and see what options are available to you and your group. The only information that is required is a range of dates. Everything else is optional. The search engine will return a list of ticket options for you, with seating and prices. You can then start narrowing down your results. Every other option you choose will give you fewer, more specific results. You can set a Price Range for the amount that you are willing to pay. You can specify a specific Show Title, or maybe just a specific Type of Show. You will get results that show you dates for shows, audience seating sections, and a variety of pricing programs (see below). With a Price Range set, you can view all available pricing options, or look for Special Pricing Programs based on the nature of your group. What is a Group Program? The term "Group Program" refers to group discounts on tickets for Broadway shows. To get such discounts, which range from 10 to 50%, you must buy a minimum number of tickets. Minimums vary from show to show. What is an Early Bird Special? Some shows offer groups an Early Bird Special on tickets prior to the opening of the show, or before an upcoming season of the year. This is an additional discount for groups. It is usually 10% more than the standard groups discount and tickets must be bought within a period of time specified by the show. There will always be a must-order-by date, and then a must-pay-by-date to take advantage of any early bird program. What qualifies someone for a Student Discount? Student Discounts are offered to students groups associated with primary to university level programs. A minimum number of tickets, as specified by each show, must be purchased to receive the discount, which may be as high as 50%. What is a COMP Program? A COMP Program involves giving free tickets to groups that purchase a certain number of seats for a specific performance of a Broadway show. These free tickets may be given by the Producers of the show or through a special COMP Program Promotion offered by All Tickets Inc. A minimum number of Group Tickets must be bought to qualify for COMPS (numbers vary) and the maximum number of COMPS offered is usually 4 per program, provided by Producer and All Tickets, as available.